Just recently I received an email from Australia commenting on my German Colony tour. I am a descendant of Matthaus Frank, he is my great-grandfather, and I was hoping you could send me, via email, information on him as I have very little knowledge about him to pass on to my daughters. Thank you in advance, Kind regards, Petra Frank, Clayton, Australia. It’s always nice to hear from someone who is engaging with my site. It’s an opportunity to delve a little deeper into the neighborhood where I live and know very well. So I did some research and found some old photographs in architect David Kroyanker’s excellent book “Jerusalem – the German Colony and Emeq Refaim Street” (the book has only been published in Hebrew). I also went out and took some of my own photos of the German Colony today and the Templer cemetery. 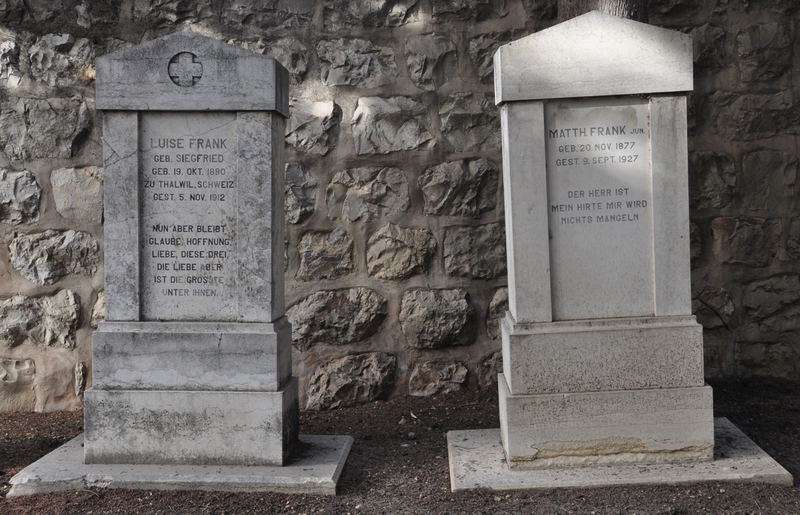 I learned that there were two Matthaus Franks, father and son and that the son wrote about his life in Jerusalem. For those into genealogy there is enough information in the cemetery to start a family tree. 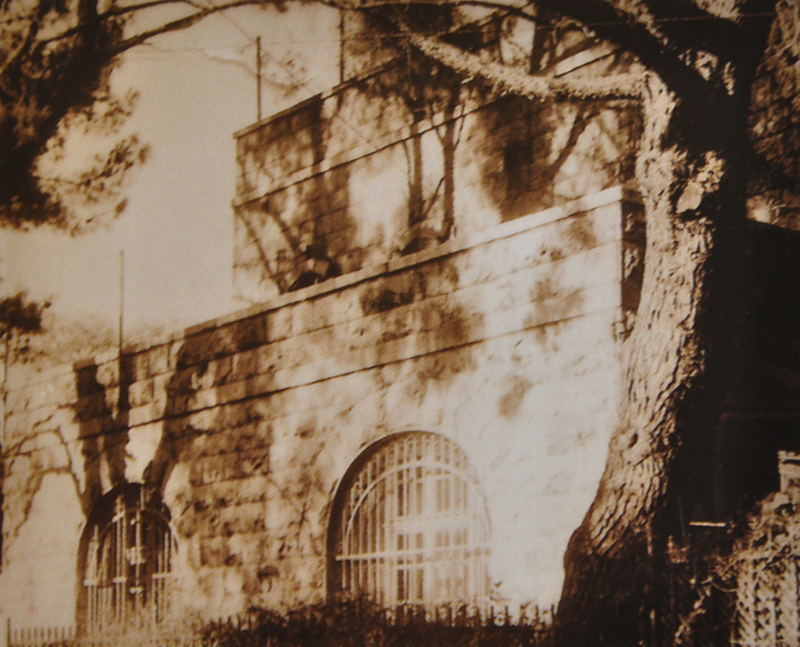 The German Colony in Jerusalem was founded when a small group of German Templers arrived in 1868. At first, they rented housing in the Old City and in Mishkenot Sha’ananim, the first Jewish neighborhood built outside the walls a few years earlier. From 1867 it became possible for foreigners to purchase land, on condition that their European government had signed an agreement with the Ottoman Turkish authorities which Prussia, representing Germany, did in 1869. 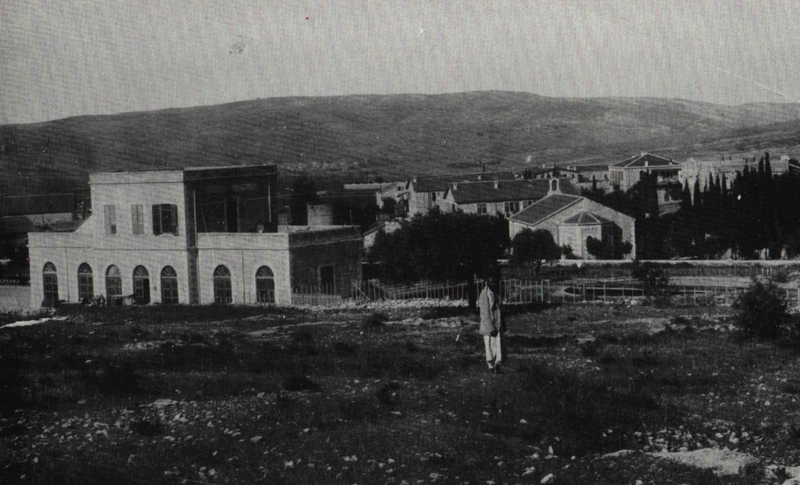 Consequently, in 1872 young Matthaus Frank (1846-1923) purchased a large plot of land suitable for farming from the Arabs of Beit Safafa for his father-in-law, Nikolai Schmidt. 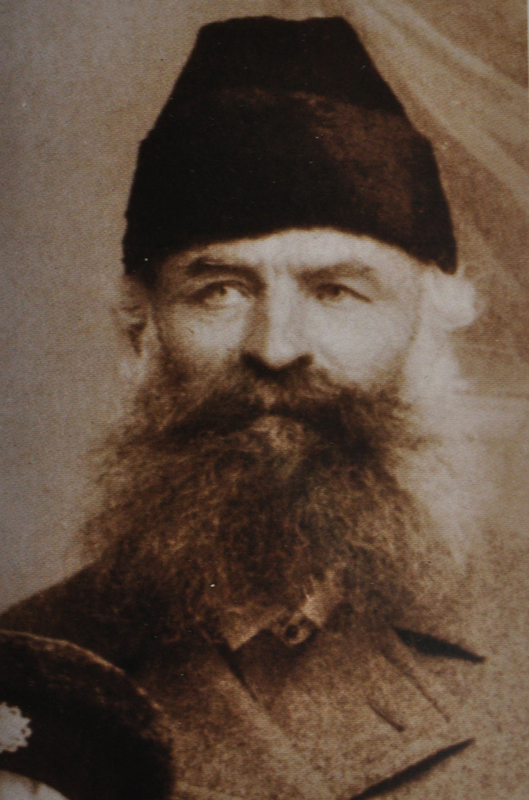 Schmidt travelled to the Holy Land in 1874 with a group including his wife Katharina but died on his way to Jerusalem. The German Templers bought the land from Frank and divided it into 1 dunam building lots – bounded by Emek Refaim Street and Derekh Bet Lehem. 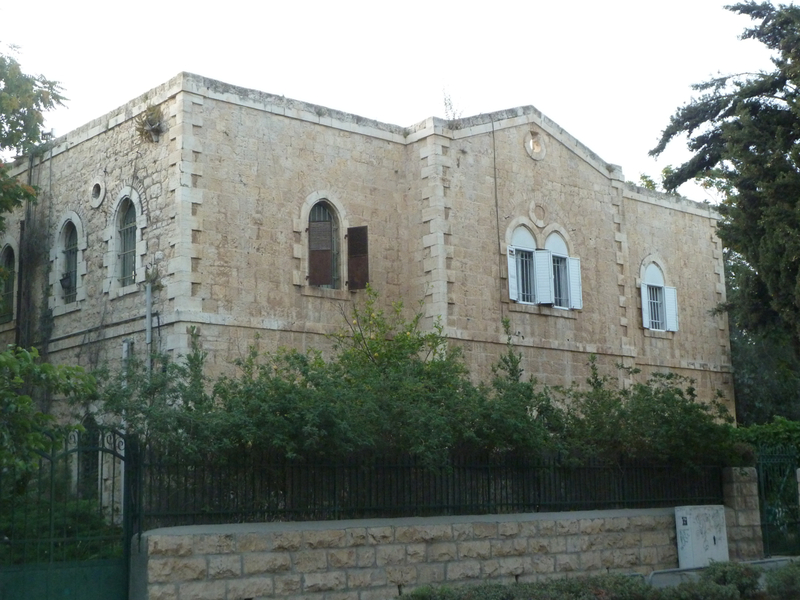 This became Jerusalem’s German Colony and in 1878 the spiritual center of the movement with a school, sport club and Gemeindehaus, the community center and church on Sunday. Two historic events took place shortly thereafter, the completion of the railway that joined Jerusalem to the port at Jaffa in 1892 – today the station has been renovated and is a popular meeting place of food and culture and the German Kaiser Wilhelm II and Augusta Victoria’s official visit in 1898 – the three churches that were initiated then stand to this day as part of Jerusalem’s skyline. 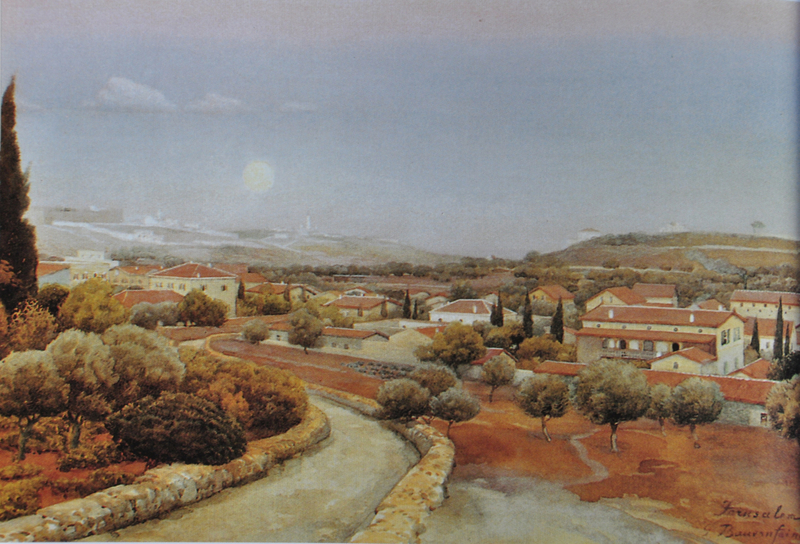 This aquarelle painting by Gustav Bauernfeind (born Germany 1848 – died in Jerusalem, 1904 and buried in the Templer cemetery) and the photograph from about 1890 (train station is already built) document what the German Colony looked like. The painting was presented to the Kaiser on his visit. Bauernfeind was a German painter, illustrator and architect of Jewish origin, considered to be one of the most notable German Orientalist painters. Frank kept 5 dunams for himself and on it he built his house in April 1873. It was the first building to be completed, the home of the miller Matthaus and Gertrude Frank, today #6 Emek Refaim Street. You can see the date on the keystone of the arch above the door and the name EBEN EZER carved in the stone lintel, mentioned in Samuel 7: 11 when God helped the Israelites against the Philistines. 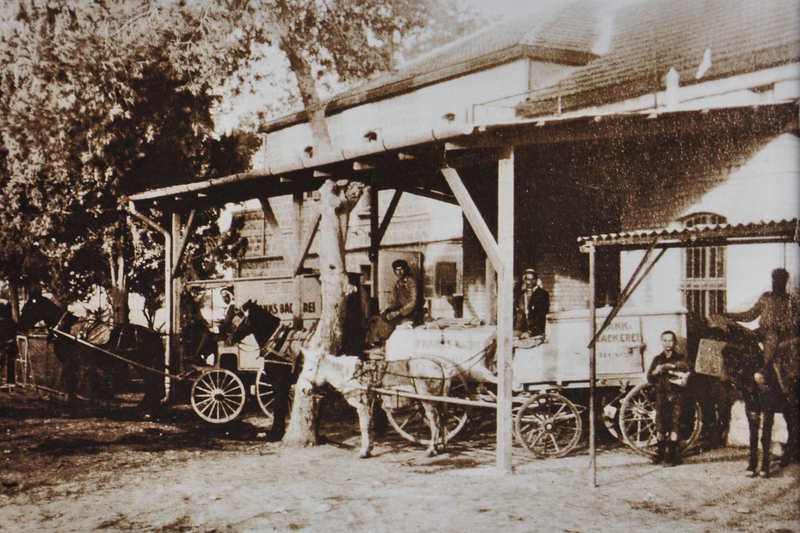 Frank installed the first steam-driven flour mill and ran a bakery. Up until then there were only windmills for grinding wheat. Two exist to this day, Montefiore’s windmill built in 1867 beside Mishkenot Sha’ananim and a Greek owned windmill on Ramban Street, later the office of Erich Mendelsohn who fled Nazi Germany in 1934 and split his time as a successful architect between London and Jerusalem. A fellow German Templer, Theodore Faust, describes the Frank house in his handwritten memoirs. A large garden with fruit trees, vegetables and flowers, and the ‘proud’ two-storey house, like a fortress or castle, that’s what we thought as children, with a steam-driven mill, stable for donkeys and other buildings, with the spacious living quarters above, there was the kindergarten of the Colony for many years. Behind the house was a large vineyard, and the property was six times as large as a regular property. In addition to the usual underground water cisterns there were two open pools, one large and one small where sometimes the children were allowed to swim and so perhaps this was the first private swimming pool in Jerusalem… In later years, the Frank house was a popular meeting place. In 1910, Mattheus Frank the son (1877-1927) decided to rent the house to a Templer family, the Kirchners, who lived there until 1917. Frank and his wife Luise moved the family to a new property (Neue Mühle) on Derekh Bet Lehem where they lived and ran the bakery (Franks Bäckerei). Only the two large arches of the ground floor façade exist today, as the entrance to underground parking for a housing development. 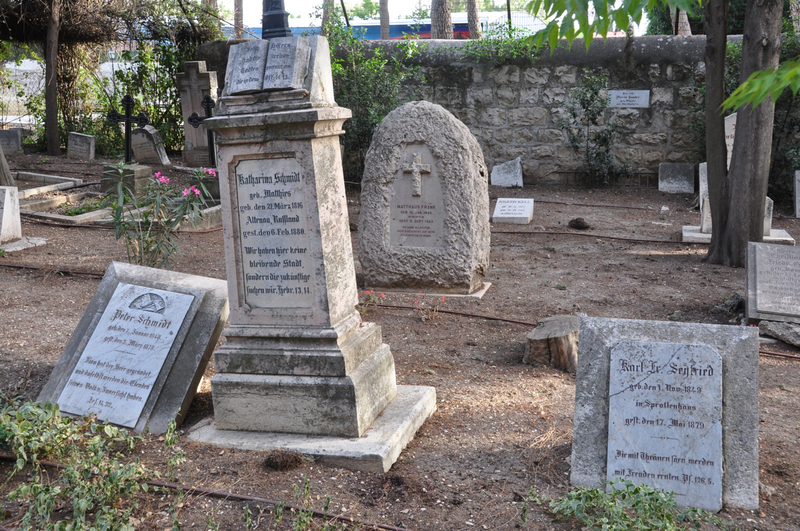 The Templer cemetery is the final resting place for these pioneers and this is where our tour of the German Colony ends. This entry was posted in 1900s Photos, Architecture, Guide, Jerusalem, Train and tagged dining, Emek Refaim, German Colony, German Templers, walking tour on July 16, 2013 by Shmuel Browns. If you want to meet up with a friend in Jaffa all you have to say is “Meet you at the clock tower”. 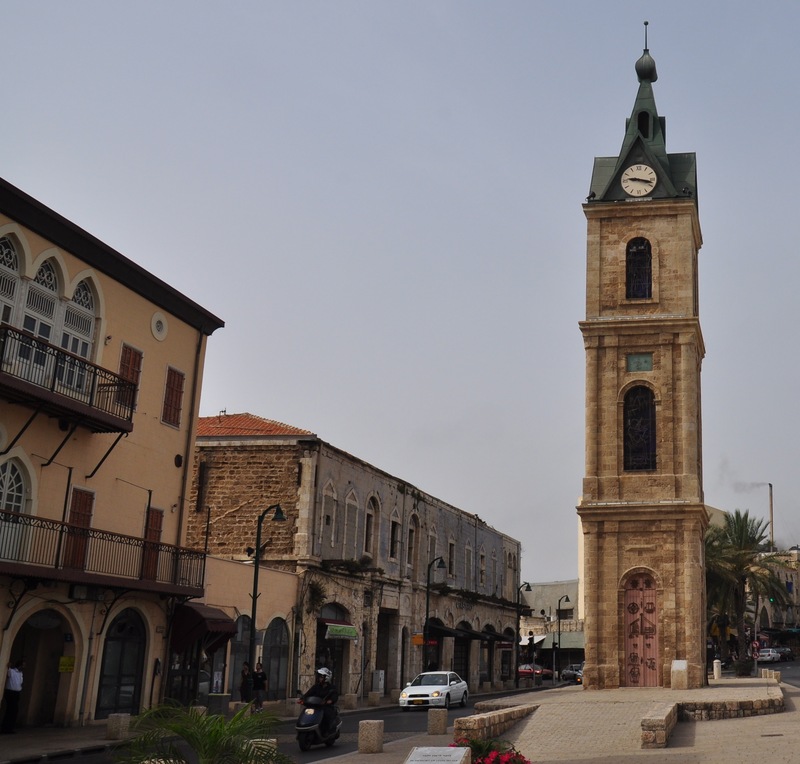 The clock tower in Jaffa is one of seven built by the Ottoman Turks in 1908 on the occasion of the silver jubilee of the reign of the Sultan abd al-Hamid II. From there you can explore the Flea market and shops and restaurants. There’s a funky restaurant called Pua on 3 Rabbi Yohanan Street. For what some people swear is the best humus go to Abu Hassan’s. For a truly middle eastern taste try the stuffed breads at Abulafiya’s. There is something else that Jaffa is known for and that is the shamouti orange which is known throughout the world as the Jaffa orange. The shamouti was a new variety developed by Arab farmers after first emerging in mid-19th century Palestine as a mutation on a tree of the Beladi variety near the city of Jaffa. Orange exports grew from 200,000 oranges in 1845 to 38 million oranges by 1870. Today the orchards described by a European traveller in 1872 “Surrounding Jaffa are the orange gardens for which it is justly extolled…” have disappeared in the face of urban development. 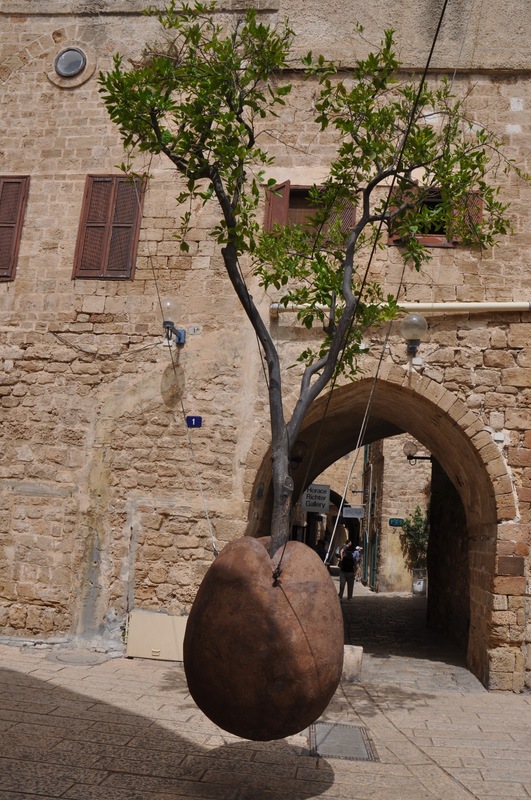 But walking through the alleyways of Jaffa you can find an incredible sculpture by the environmental Israeli artist, Ran Morin, called Orange Suspendu that reminds us of the connection between the city of Jaffa, the earth and the orange tree and its fruit. Morin has 2 other tree sculptures that are worth seeing in Jerusalem, one at the Hebrew University on Mount Scopus and one in the Olive park near Kibbutz Ramat Rahel. From Jaffa, walk north along the promenade to Neve Tzedek, the first Jewish neighborhood that was established outside the walls of Jaffa in 1887 and that some 20 years later grew into the new city of Tel Aviv. Along the way drop in to the old Jaffa train station, that is being renovated and developed into a cultural, artistic and commercial area. 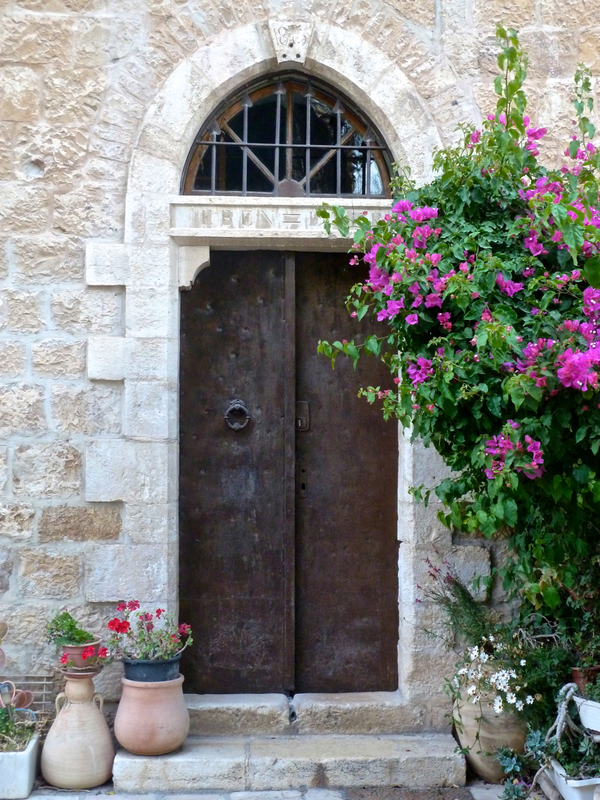 For a guided tour of Tel Aviv-Jaffa please contact me. It’s possible to incorporate riding a Segway along the whole length of the promenade as part of your tour. This entry was posted in Art, Family, Food, Guide, Tel Aviv and tagged Ran Morin, sculpture, tree sculpture on June 13, 2010 by Shmuel Browns. We celebrated our daughter Tiferet becoming a bat mitzva with family and friends in the archaeological park along the southern wall of the Temple Mount early in the morning – that was back in August 1996 and I still remember how hot it was by mid morning and how our younger son Amitai who was 6 years old at the time foraged for figs that grew on the trees nearby. 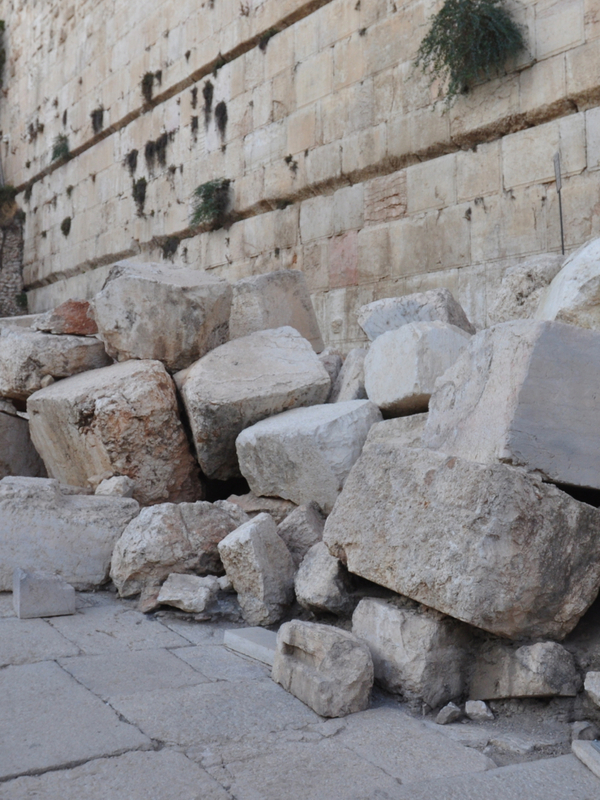 Today the popular place is on the Herodian street that runs along the Western Wall, among the massive stones that were pushed from the wall by the Romans almost 2000 years ago, a silent reminder to the destruction of the Second Temple and the downfall of Jerusalem. We celebrated our son Uriel becoming a bar mitzva by organizing a trip to Peru with close friends, hiking for 4 days along the Cuzco trail to the sacred Inca site of Machu Pichu. We carried a Sefer Torah with us which we read on Monday and Thursday on the trail, on Rosh Hodesh (the new month) at Machu Pichu and on Shabbat back in Cuzco. Some families decide to celebrate with family and friends in Israel and have climbed the Snake Path to the top of Masada at sunrise, as a sort of physical rite of passage and celebrated a bat mitzva in the ancient synagogue or one of the rooms in the casement wall used by the Zealots. You might like to celebrate a bar or bat mitzva within the ruins of one of the ancient synagogues, for example at Baram or Korazim in the Galilee or at Herodium. Besides it being meaningful to experience Israel as part of becoming a bar or bat mitzva, friends and family can explore and enjoy the sites and nature of Israel and feel the connection between the Torah reading and the land. As Reb Shlomo Carlebach used to say, “The Torah is a commentary on the world and the world is a commentary on the Torah“. Not every guide is able to make all the arrangements necessary for a bar or bat mitzva celebration in Israel – provide a Sefer Torah, take professional photographs, arrange the prayer service, do the guiding that makes Israel part of the experience. I handle the logistics and you get to experience a memorable time. I would be happy to help you arrange your bar or bat mitzva in Israel, just contact me. Here are some of the photos that I took at Rachel’s bat mitzva in the summer. This entry was posted in Archaeology, Family, Guide, Nature on September 22, 2009 by Shmuel Browns. As a guide, I’m often asked for restaurant recommendations so here are some suggestions for restaurants to try in Jerusalem. There are many websites with lists of restaurants, reviews, etc. – my idea is to recommend a few (I’ve listed about 30) that I feel are special in some way (ethnicity, atmosphere, cuisine, location, view, food) and that are likely to be close to where you are. Those marked [NK] are not kosher, usually means that they are also open on Shabbat. If you’re at the Mabada theater check out the restaurants in the mitkham rakevet, the old train yards: HaSadna (NK), Hahatzer (meat/fish), Guta (French) actually close by on Derekh Bet Lehem. Try Terasa at the Begin Heritage Center or Lavan [NK] (same owners as Adom) a stylish bistro at Cinemateque that have a lovely view of the walls of the Old City. Nearby on Emeq Refaim Street are all the restaurants and cafes of the German Colony: Luciana (Italian), Joy (meat/fish), Olive (meat/fish), Taiku (Asian), Ryu (Asian), Caffit (dairy), Masaryk (dairy), Coffee Mill and the list goes on and on and changes often – it’s hard to go wrong. In town, off Jaffa Road at number 31 enter Feingold Court through an arched passageway and find a bunch of restaurants: Dagim B’Hatzer (fish), Eldad V’zehu, Sakura (Japanese) [NK], Barood [NK], Adom [NK]. In the Nahalat Shiva neighborhood there is Tmol Shilshom (dairy/fish) in the courtyard and others along the street; at the bottom on Hillel Street there is Spaghettim [NK] with more than 50 sauces. Farther up Jaffa Road on the right take HaRav Kook Street and you can find Anna Ticho House, Darna (Morroccan); Moshe Basson’s restaurant Eucalyptus (Israeli fusion) has moved to Hutzot HaYozer below Jaffa Gate. In the Mahane Yehuda area and along Agrippas Street down to Gan Sacher there are a wide selection of restaurants Topolino (Italian), Ichikidana (Indian vegetarian), Mizrachi, Azura, Rachmo, MahaneYuda (NK), Ima (Kurdish). To help you find your way around Mahane Yehuda check out my map. This entry was posted in Food, Guide, Jerusalem and tagged cafe, dairy, fish, hummus, Indian, Italian, Japanese, kosher, Kurdish, meat, Moroccan, restaurant, seafood on April 23, 2009 by Shmuel Browns. A guide will work with you to create a tour customized to your interests. A guide can handle all the logistics (itinerary, accommodation, food, transportation) for you and probably save you money. A guide can take you to places that you would never know about even if you spend a lot of time reading guide books or searching the Internet. A guide will point out things that you would never notice. A guide will explain and make sense of what you are looking at. A guide will put what you are seeing in its historical, religious and cultural context. Using a guide is the best use of your time, you’ll get to do and see more. 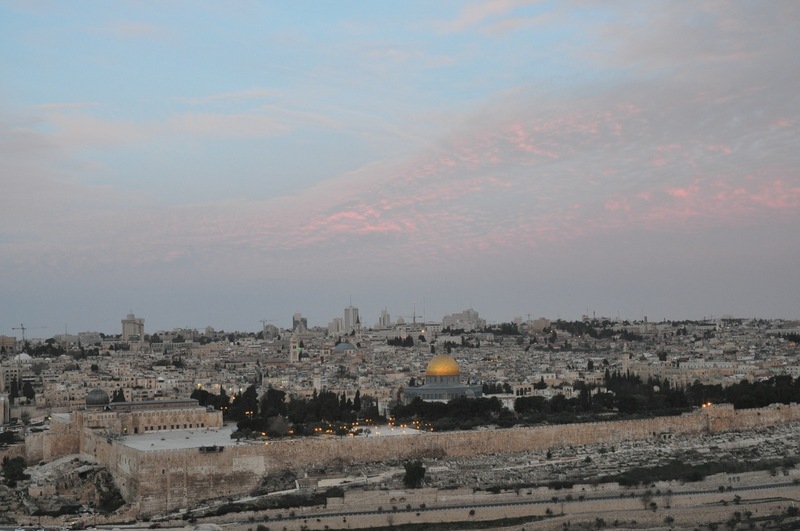 A guide is educated and trained to guide and then licensed by the Israel Ministry of Tourism. A guide is experienced and up-to-date. A guide is your personal resource, answering your questions and able to suggest things that match your interests, both before and during your trip. So on your next trip, think about hiring a guide, maybe for part of your trip or for a special site or subject that you are particularly interested in. Consult with your guide about recommendations for less expensive accommodations, interesting hotels, hostels or B&Bs, best deals on car rentals, cheap but good restaurants. Get together with friends or others at your hotel and together hire a private guide, it will turn out to be cheaper than a larger, fixed itinerary group tour. But don’t take my word for it, ask your friends or Google “Why hire a guide” to read other peoples’ views; here is one article I found on the Independent Traveler website “When Do You Need a Tour Guide” – good advice. I guided two people, one a young woman who is a jazz singer currently living in NYC and she sang a hymn in the Church of Santa Anna – now that was a treat. I guided a couple and her 70 year old mother focussing mostly on Christian sites in the Old City. “… a very professional and dedicated guide – Shmuel was super – he went above and beyond what was expected and left us with one of the most beautiful days of memories of our trip – He was patient and kind and incredibly knowledgeable! I guided a father and his 22 year old son, both engineers. It’s not the first time I’ve had a client who has a Nikon digital SLR and iPhone but this is the first time a client is blogging about the tour. Check it out here. I guided an extended family of 8 (both sets of grandparents, parents and children, 11 and 13) for 5 days. I guided a mother and her 16 year old son on their first trip to Israel. “Thank you for helping to make our trip to Israel so memorable! I guided a couple who were interested in archaeology and specifically Herod’s palace/fortress at Herodium. I guided a Christian couple interested in archaeology and Israel. I guided a couple who were visiting their daughter who is studying International Medicine here. “We are back in the US with lots of wonderful memories from our time in Israel. We want to thank you for being our guide in Jerusalem. You well earned your fee and we are grateful… Know that your skills as a guide are recognized and deeply appreciated. I guided a father and his 2 grown daughters around Herodium, visiting for a family bat mitzva. I guided a couple and his older parents (the father used a walker or wheelchair for longer distances). We drove from Tel Aviv through the Negev down to Sde Boker. I am registered on the Viator travel site as a guide. This website/blog was chosen as the #1 site out of more than 100 guides. I am registered as a local guide for Israel by ToursByLocals, a site designed to connect travelers with local, qualified guides. I offer tours through TourHQ. I’m one of eight guides recommended by Frommer’s Jerusalem Day by Day guidebook (see page 21). This entry was posted in Guide on February 15, 2009 by Shmuel Browns.